"The Duchess of Cambridge was delighted to be able to step in for her father in law, The Prince of Wales, who has shown her so much support over the years". Kate appeared to be carrying a glass of water instead of champagne. This will fuel the pregnancy rumours but I assume she wanted to represent the royal family with a completely clear head. I cannot tell you how much I adore Kate's look here, She looks absolutely stunning. Wearing a vintage Amanda Wakeley fall/winter 2006 (With thanks to What Kate Wore Facebook) floor length dove grey gown, Kate looks glamorous, sophisticated and could easily pass for a supermodel. I simply adore the detailing on the criss cross straps. Kate is only 29 and I'm thrilled to see her dressing for a young woman. The Duchess generally covers up her arms and for me this is a big fashion moment for her.....Beautiful! Kate wore her beautiful Jimmy Choos Ubai shoe which matched embellishment on her dress perfectly. Kate previously wore these shoes to the BAFTA reception. Kate's shoes and dress sparkled last night and her jewellery played an important part in completing the look. 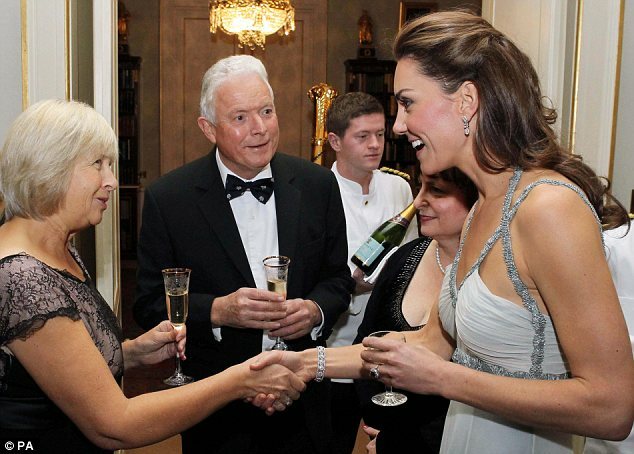 Kate wore a beautiful diamond flower cluster art deco bracelet she wore to the BAFTA reception and stunning diamond cluster drop earrings (With thanks to Jenny from WKW) she wore to Zara Philips wedding. It is reported these pieces were given to Kate around the time of the wedding. Possibly a gift from William or family pieces given to Kate for royal engagements? 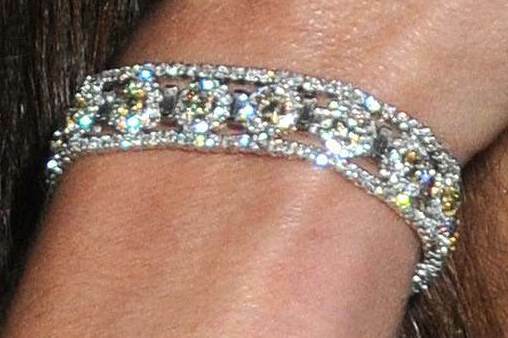 More information on Kate's jewellery Here. "Kate Middleton's hair looks really natural and to achieve this look most people would need to use temporary, virtually invisible, strip hair extensions". This is completely false, The Palace confirmed it was a scar from surgery Kate had as a child. I'm not surprised to hear the story is false as Kate has always had beautiful, long hair. InKind direct was founded by Prince Charles to encourage companies to donate surplus goods to charities, either for use by them or for their charitable work. 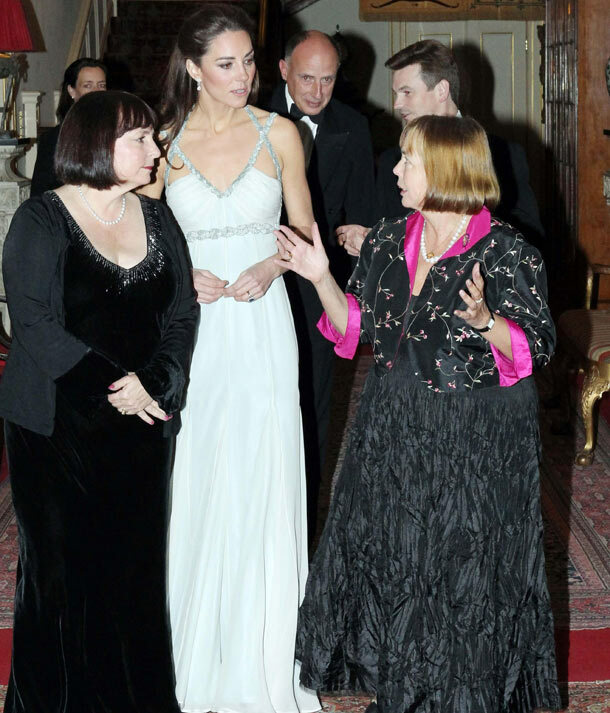 The charity's chief executive Robin Boles was delighted with Kate and couldn't praise her enough. And if we didn't love Kate enough already she called her mom Carole, to ask her to donate any surplus products to the charity. "You would never know it was her first solo engagement. It was as if she had been trained by the Prince of Wales. She was completely natural, professional and charmed everyone. She spoke to every single guest and was genuinely interested, and interested in continuing to help. She said she had already called her mum to tell her about us in case Party Pieces had surplus products". The Duchess of Cambridge clearly did herself and the royal family proud appearing completing at ease with the guests. This is exactly what I wanted to see for Kate, She is coming into her own. I had thought it would be a tad longer before we would see her complete her first solo engagement. Kate is definitely the perfect royal. Kate also stepped into the role with very little notice proving how reliable and adaptable she is. Her style is evolving and without a doubt this is one of her most beautiful looks. Kate looks STUNNING!!! Except for her wedding attire, this is her best look yet. Do you know anything about the bracelet and earrings? The whole outfit is perfection!!! Thank you for the report. You always do a fabulous job and I love your blog!!! Rachel - I am updating the section on her style shortly and will include all details on jewllery. Bonnie - She looked beautiful, my favourite look yet. oh man. love her! i was so excited when this came on the tv at work today, you have no idea!!! i love it! i was wondering: why didn't camilla step in for charles? there have been no reports camilla went to saudi arabia (not surprising since there would have been no place for her, literally, at the funeral). wills was working. so we know why he didn't attend. harry is in america, training. do you think there was a conscious decision to pick the glamorous, media-magnet kate over camilla? charles is v loyal to camilla, so it's hard to imagine he would ever imply such a thing. unless this is part of a bigger strategy to give kate periodic royal jobs, so she is not accused of not doing anything? by making the job a "stepping-in" for an emergency (and with the happy families side story of "darling daughter-in-law" and supportive charles), they stick to the official line that she is a service wife and do not build expectations of her doing anything more, esp without wills. What do you think? The story is as it appears, or do my machiavellian fantasies have grounding? That is a very good point Alpa. Looking at the photos from the event one could see the guests seemed to much older than Kate and it seemed to be a very quiet affair. I think when Prince Charles was called away, they saw it as an opportunity to ease Kate in. It was reported Kate would not perform a solo engagement until the new year as it was reported she would not choose a charity to support. Now she has done both quietly with the media finding out afterwards. Whereas there would have been a media storm if the news had been released beforehand. I know Prince Charles is reportedly jealous of the attention William and Kate get so I imagine it may not have been his idea. Also as Duchess of Cambridge I think Kate has to do a certain amount of engagements. She looks great! I absolutely love her! I'm very interested about the make-up products she uses... Do you have the answer, please? Thanks, girl! Your website is the best! Thank you for your kind comment Ana B.